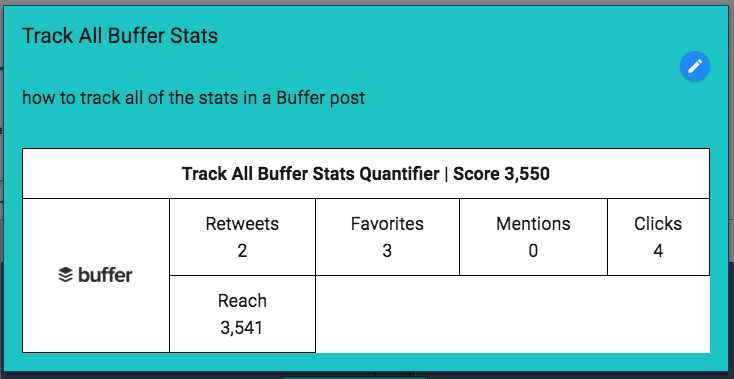 You can automatically track analytics via Buffer, including the number of clicks on a URL in your social media post and the number of “likes” and shares. Following are directions on how to do both. Tracking the full stats is a bit trickier than our other integrations, but you can do it! Note: You only choose one of these options within a project, so we suggest setting up a Custom URL Tracker to track the number of clicks if you want to do both. 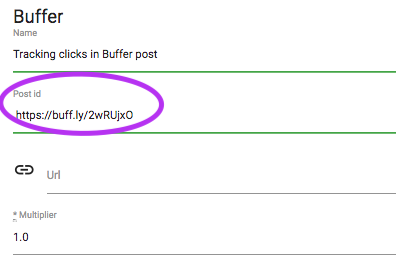 Integrate your Buffer account via the Settings button. 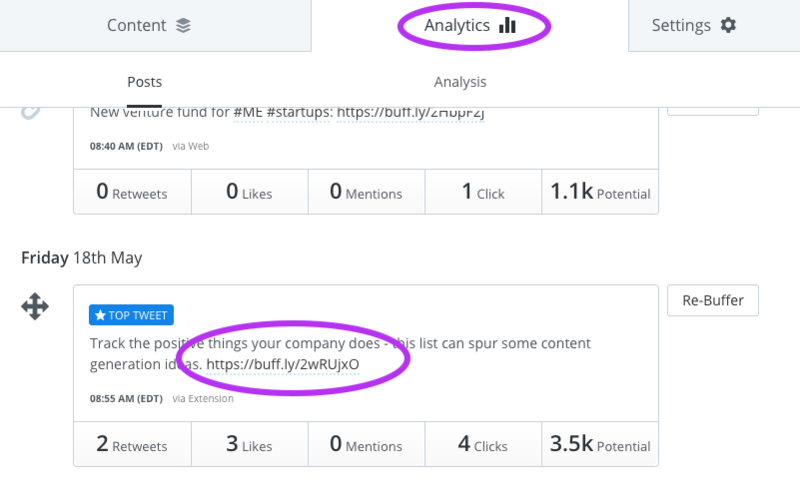 Navigate to your Buffer account and click on the Analytics tab. Create or edit a project in your PlanIT. Navigate to the Integrations section and select Buffer from the drop-down menu. Enter a name and paste the buff.ly URL within the Post ID section; click the blue SAVE button. When you are returned to the main project window, click SAVE. From your PlanIT timeline, simply click on the project to view the number of people who clicked on the url. You can track all Buffer stats within a project, but it is a bit more complicated than our other integrations. You can handle it! Here’s how. 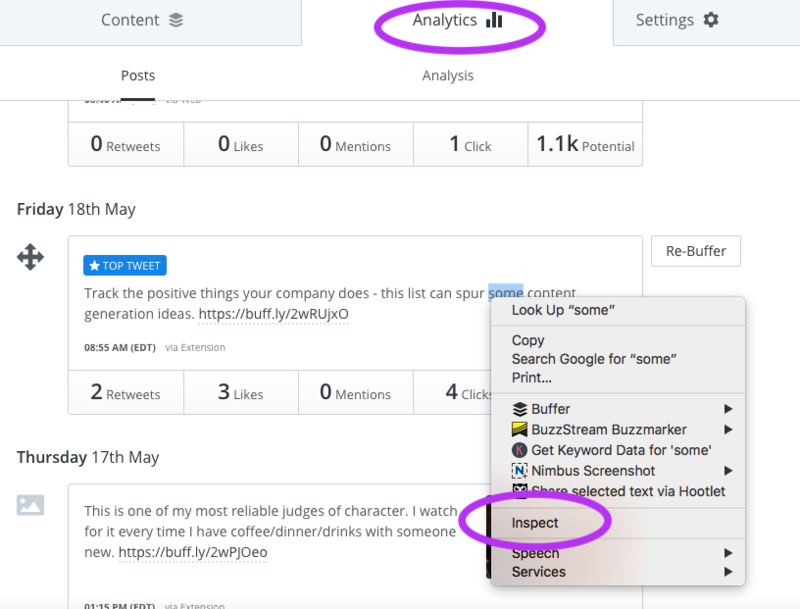 Navigate to your Buffer page and click on the Analytics tab. If you use Windows, right-click on the post you want to track; if you use a Mac, two-finger-click on your trackpad. Click on Inspect in the drop-down window. This will open a window showing all sorts of code. Don’t panic. Select the post you want to track, and you’ll see a series of lines that start with <li id=”update- …. Click on the lines until the post you want to track is highlighted. Copy the code that follows the words “update- line. High five! 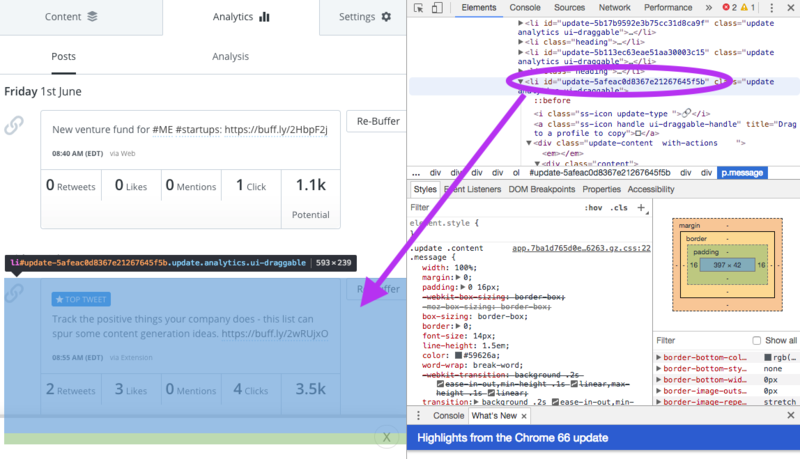 All of your Buffer stats are now automatically tracked in your Project! Have questions on how to use PlanITPDQ? Just reach out – we always have time for you. For more tips on using PlanITPDQ, visit the PlanITPDQ How To page. Have you signed up for your beta account yet? Build your marketing plan, create a content calendar, plan out your editorial calendar, and more!